It is back to school time again, how did that happen?? Where did the summer go??? This summer went by the fastest ever!! We had a glorious one weather wise but alas we now have to send the kids back!! For this #SundaySupper I wanted to come up with a granola bar that was really healthy. I have made them before and here is the recipe but they didn’t have the healthiest of ingredients. 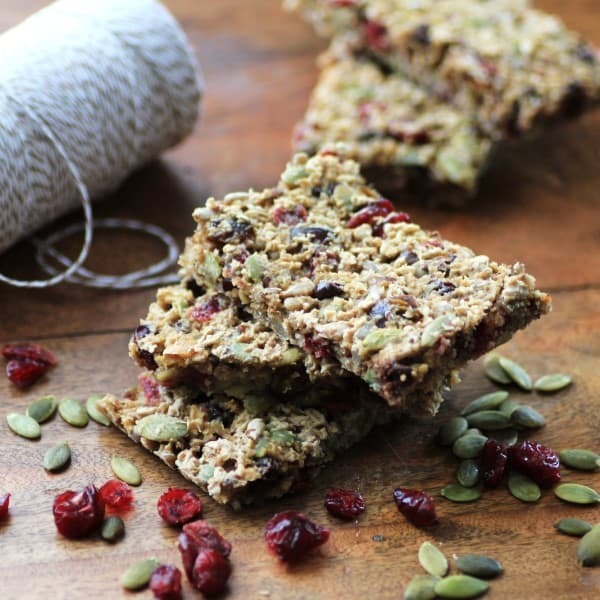 These Playground Granola Bars are healthy, delicious and importantly peanut and nut free for school. That doesn’t mean they aren’t absolutely delicious because they are!! Loaded with yummy ingredients and of course who can resist to add a bit of chocolate too!!! They are sweet, crunchy, moist and delicious!! Kids will love them and parents will be happy to include them into their lunch box. My daughter would always grab her snack and run out to the playground at recess. That is where I thought of the name. Most kids are on the go with their snacks and these will be a perfect grab and run treat!! 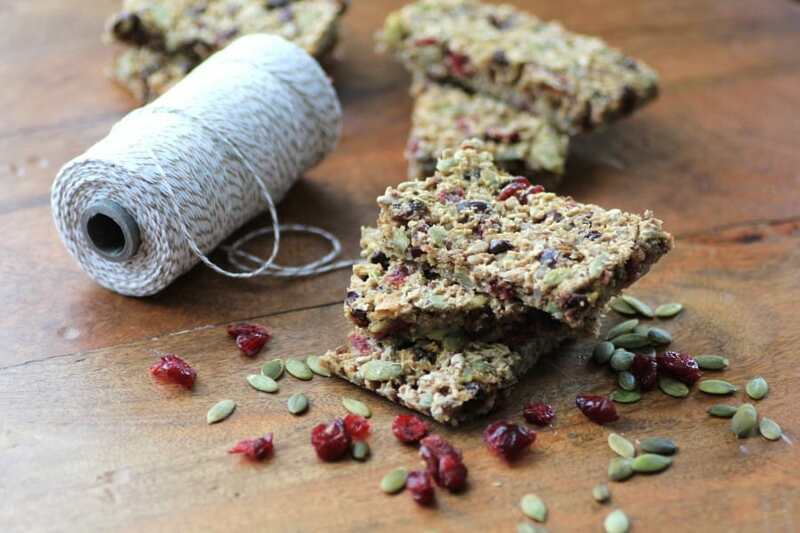 These granola bars are full of pumpkin seeds, sunflower seeds, cranberries, dates, chocolate, and oats. I even put some flax seeds in them for an extra boost of omega 3 fatty acids!! They will fill you up and keep you going for the rest of the morning!! 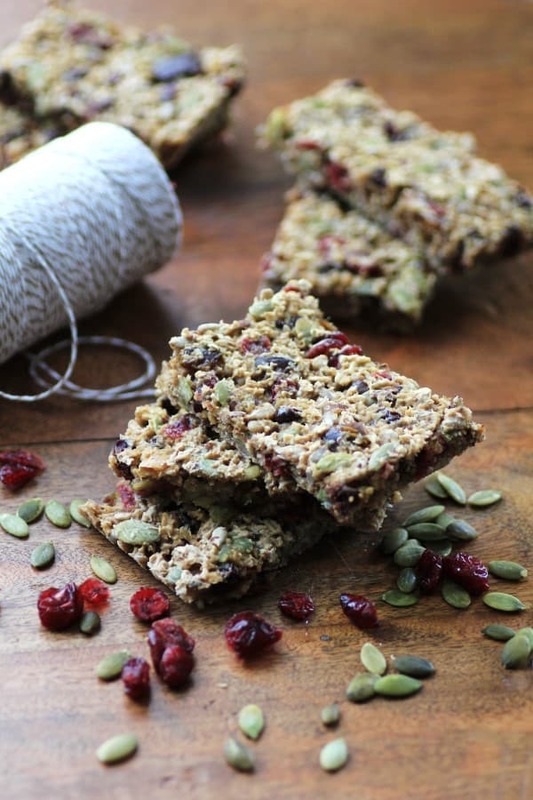 A healthy granola bar that you will be happy to put in your kids lunchbox!! Preheat oven to 325 F. Prepare a 10x15" pan with foil that is sprayed with cooking oil. Mix all the ingredients together. Spread evenly into pan and flatten slightly with a spatula sprayed with cooking oil. Bake 325 F for 20-25 in. Let cool and cut into rectangles. They will be still moist on the bottom. Keep in the fridge until ready to eat. 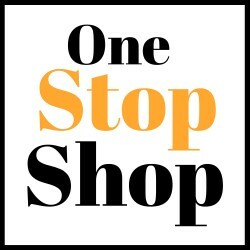 Here are a fabulous line up of great recipes to help you get back in the swing of school!! Oh Kim, you are always so kind, thank you so very much!! These are the perfect grab and run treat!! Sweet memory of your daughter, too! Now these are some yummy sounding granola bars, Tara! Perfect ANY time of day! 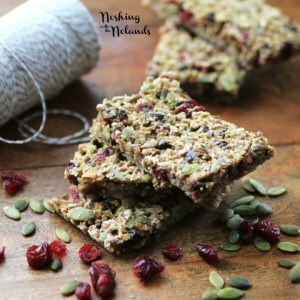 I really need to try my hand at homemade granola bars – yours look so so so yummy! I really want to make them more, I love them!! Thanks Katie!! Firstly, your pictures are stunning! The pumpkin seeds and the cranberries are so delicious looking and the whole combo of healthy fruits and seeds and chocolate look so appealing. I don’t have a good granola bar recipe and I’m excited to try this! Thank you so much Lisa, I am enjoying one right now!! Mmmmmm … I’m going hiking tomorrow with M and her little ones. These look like delicious snacks for us to take along. Do you use blocks of dates when you made these or fresher ones? I can’t stop eating them, they are so good!! I haven’t used a block of dates forever. You can get the fresher ones easily now. Enjoy Jill!! Love the name! It makes sense and looks yummy. Great photos! Great idea to pack these with seeds and keep them nut free for schools!! Tara, these are some gorgeous photos! Thank you so very much Marion!! What a great idea and your photography is absolutely gorgeous!! Thank you so very much Isabel!! These look awesome, I need to pick up some pumpkin seeds! I know, this summer went way too fast! 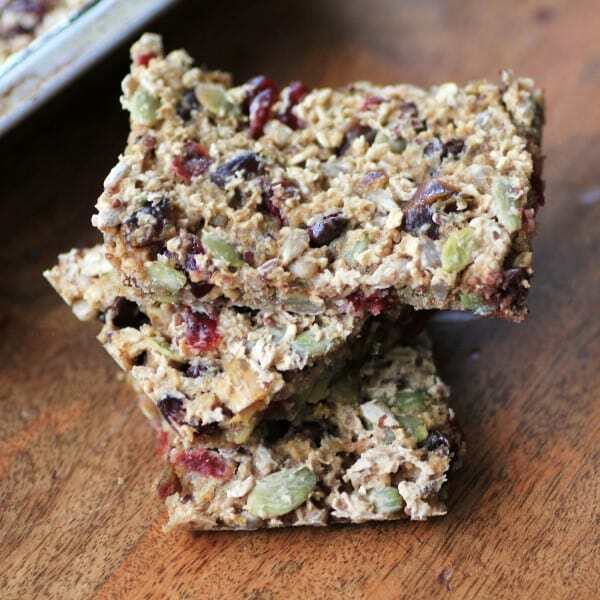 !Love your granola bar recipe and it seems like the perfect snack for my kids.Would love to try it! What a perfect healthy snack! My kids will love the chocolate and dried fruit in them and so will I. Thanks so very much Gwen, they turned out really good, they are almost gone already!! Who needs kids as an excuse to make these anyway. I am all over this recipe. Thanks so much Marlene!! I have eaten more of these than my daughter, so no need for kids!! You have inspired me to try my hand at making a homemade granola bar. I love how full of ingredients yours look. Great recipe. They are so easy and so good, thanks Sherron!! Forget the kids, I want these for a snack! I love this recipe and can’t wait to give it a try! Love this recipe Tara! I’m really into making my own breakfast bars lately. These look so colorful too, will definitely have to give these a try! Thanks so much Shelby, enjoy!! Wow these look so yummy! Great homemade snack here. I can’t wait to try! Thanks Tammi and thanks so much for hosting!! These are jam packed with so much goodness! The kids love them so I am so happy, thanks Sarah!! I am granola bar obsessed! This is a new recipe for me to try out. Very colorful Tara! Love the textures! This looks like the perfect mid-day pick me up (grown-ups need those too!). The colors are gorgeous and put me in the mood for fall. I know that my son would love these! (Not to mention myself)…such wholesome, delicious ingredients. Thanks for the recipe Tara! Hi Emily, I have two boys staying with me right now and they loved them. Devoured the tray! These look amazing. Can’t wait to try your recipe. Found you from a feature at Munching Mondays! Thanks so much Theresa, the kids sure gobbled them down! !